Kevin Barber | Far Post Soccer Club, Inc.
Head Coach, 2007 Boys Premier. 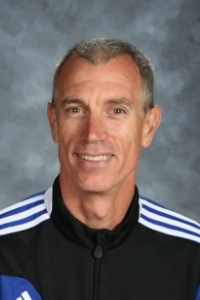 Kevin is the Head Coach of the 2007 Boys Premier team, as well as the Varsity Girls Soccer Coach at Essex High School. Kevin began his coaching career in the early 80's in San Diego coaching both high school and club levels. After graduating from San Diego State University he moved back to Vermont and began coaching for Mount Mansfield High School. Since then he has coached for a variety of teams including the Vermont Olympic Development Program. He is currently working at the Albert D. Lawton Intermediate School where teaches physical education and is the Athletic Director. Kevin has coached for Far Post for the past 11 years and has been a head coach for the past 9 years.